Deliver a world-class customer experience that will make your brand stand out from competitors and increase your customer lifetime value. The Kooomo digital commerce platform centralises all customer requests coming in from all channels - eShop, email, online marketplaces, etc. That way, you don't need to jump from one platform to another to ensure that all queries are being answered. Templates can be configured in multiple languages to handle requests quickly and effectively improve your online store conversion rate. Users get a complete view of all incoming and outgoing payments through the platform. Shipping and VAT quotes can easily be calculated for B2B customers. Risk analysis technology scores all transactions and flags and potential fraudulent activity to users, limiting the amount of chargebacks coming through your online channels. 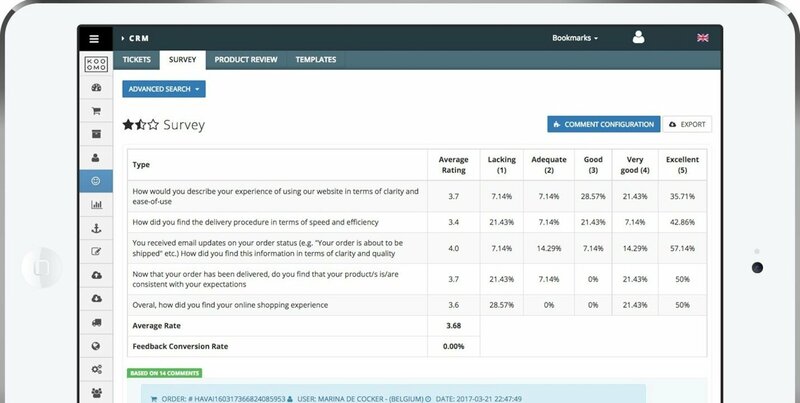 Enable customer surveys on your site to calculate your NPS, then use the data gathered to identify new ways to improve overall customer engagement and elevate brand loyalty.